A family riding down the car-free Ben Franklin Parkway on the Saturday during Pope Francis' visit. Hoping to shape a so-called Open Streets event – no vehicles in a specific zone, affording pedestrians, bikers, rollerbladers and skateboarders space and safety – this fall, the city is conducting an online survey. “We want to hear from Philadelphians to shape the specifics of the Fall 2015 event,” reads the introduction to the survey. 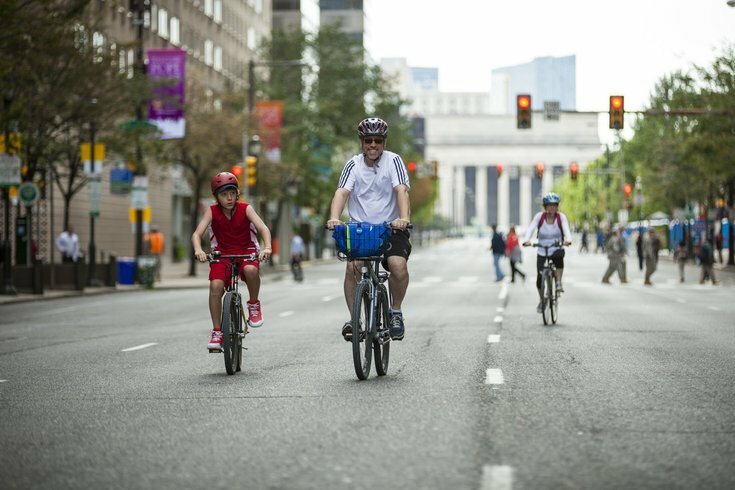 “Your input could set the stage for a citywide Open Streets program that brings the experience to neighborhoods across Philadelphia,” it concludes. The movement is an outgrowth of the empty streets imposed on Center City and University City for three days by the Secret Service when Pope Francis visited the city at the end of September. The unintended result of the vehicle ban was that residents and visitors took to the streets in an unprecedented way. Unlike that ban, an Open Streets event, likely in November, would take place in a much smaller area and would not include a weekday. The wide sweep, duration and militarization of the vehicle-exclusion zone prompted widespread criticism during the pope’s visit. “The goal of the Open Streets event will be to provide a free space for open activity from curb to curb. Though Philadelphia has a history of street festivals and special events, blocking off streets for free play would be a first for the City,” notes the survey’s introduction. Questions in the survey include where the event should be staged, how frequently such events should happen, best time of day and if organized events should be programmed. Calls requesting comment from Mayor Michael Nutter’s office were not immediately returned. Jake Liefer, a cyclist who has petitioned to bring Open Streets to the city, said, "We are thrilled that Mayor Nutter is looking to host Philadelphia's first Open Streets event this year, a full year ahead of schedule. The survey has received significant attention on the Open Streets Philly Facebook page, reaching over 20,000 people and 100 shares on user's pages. "We recognize that a late-fall Open Streets event may have weather challenges, but believe that the administration, working with others who host outdoor fall and winter events, such as DWRC's Blue Cross Riverrink, Dilworth Park Ice Skating Rink, and Philadelphia's Christmas Village, can make this event a success."